Gold Mining Process Flow: Jaw crusher –> Hammer mill –> Shaking table. This flow sheet is quite suitable for small scale rock gold-bearing ore processing, especially for 1-2 tons per hour capacity rocky gold. 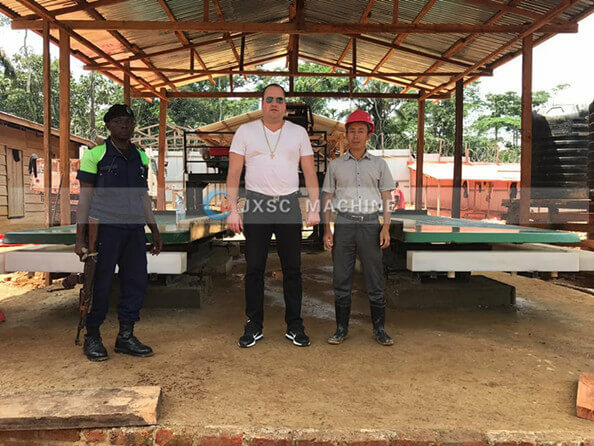 In Dec 2016, our factory JXSC built one small mining Rock Gold Ore Mining Plant for our Congo client. 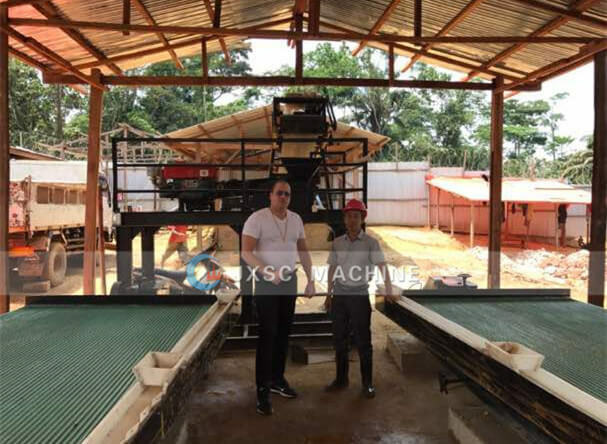 The processing capacity is 1-2 tons per hour, which rock gold mine is located in Kisangani, DRC Congo. This whole gold processing plant is composed of 1 set Jaw crusher, 1 set Conveyor belt, 1 set Hammer mill, 1 set Water pump, 2 sets Shaking tables. The Jaw Crusher and Hammer Mill are with diesel engine driving as per client’s requirement. Hammer mill is heightened on a steel support frame, with Platform and guardrail also include 2 feeding chutes to shaking tables. Feeding size of raw ores is 120-150mm, for Hammer mill, over 90% of output size we can control to -1mm, so it can feed to Shaking Table directly. 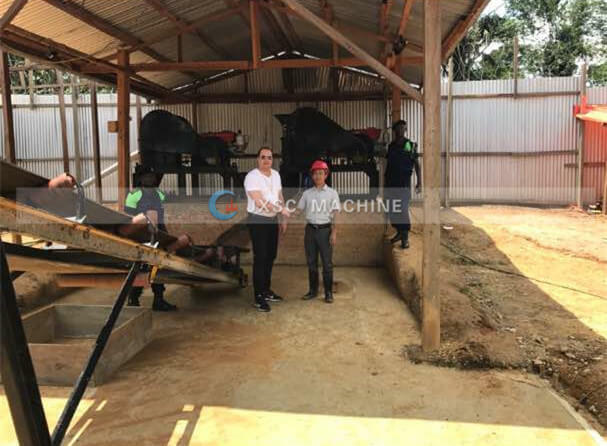 In Africa, many rock gold mine conditions are quite similar as this gold ore mining client, the raw ores are quartz rocks and gold grade is relatively high, so adopt this processing method will be very effective with high recovery rate. JXSC provide reasonable gold mining process flow chart and customizable gold extraction machine for different types of gold ore, mineral gold, alluvial gold, placer gold, stream gold, hard rock gold mining. Besides, gold extraction methods from ore are not same, CIP gold processing plant, CIL gold processing plant, cyanidation process for gold extraction). 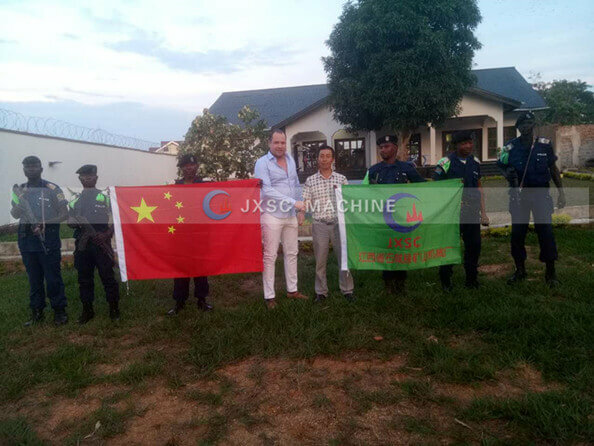 Our factory JXSC owned an experienced engineering team, which can do gold wash plant design, recommend suitable machine models, as well as provide professional installation, commissioning and complete after-sales services for customers. Our chief engineer Mr. Wen also provided installation and commissioning guidance for this small rock gold plant, as well as training workers in mine site.